Charles II is one of my historical crushes. He’s usually portrayed as simply the Merry Monarch but I always thought there was more to his personality than meets the eye. He is quite a complex figure and Fraser, in the 600+ pages of this excellent biography, skilfully brings him to life. Charles II was a survivor in a tumultuous era. He was the son of king Charles I of England and his Catholic Queen Henrietta Maria. The couple loved both each other and their children very much. Brought up as heir to the throne, his secure and tranquil existence was turned upside down by his father’s problems with Parliament which plunged the country into civil war and eventually cost the King his head. And we now get to one of the highlights of the book: the story of his incredible escape from the country to France after the Battle of Worcester , during which he faced numerous struggles (he even had to hide in an oak tree once!). Years of exile followed, during which Charles II would try to regain his throne in vain, only to be welcomed back with open arms by the English people after Cromwell’s death. The book explores both the political and personal sides of Charles II. We’re told of Charles’ loyalty to his Catholic brother James and his Queen Catherine of Braganza whom he refused to divorce even when it became clear she wasn’t capable of giving him an heir, of his loving relationship with his beloved little sister Henrietta Maria, whom he adored, and of his many mistresses. He was determined to do things his way, but without compromising the monarchy. Although he too had many problems with Parliament, and would sometimes act behind its back, he never forgot what had happened to his father and then to his country when ruled by Cromwell, so he was careful not to do anything to damage the monarchy, believing the country would be let to perdition once again without a monarch. That’s also the reason why he waited till he was on his deathbed to convert to Catholicism, even though he had very likely been a Catholic at heart for most of his life. His policies may have been machiavellic at times, but he was also a very pragmatic man and a patriot. And when his people needed him, he was there. For example, when the Great Fire Of London ravaged the city, instead than just giving orders from afar, he personally helped to quench the fire by handing out water and shovelling dirt on it, putting his own life in peril. He would also mix with his people, walking freely amid them without fear. Because of this and what he went through during his exile, he was always in touch with his people and could understand them better than most monarchs ever understood and knew their subjects. And in return, he was loved by them. Of course he wasn’t perfect. He was cynical, lazy and dissimulating, but after everything he went through in his life, that’s hardly surprising. Overall, when I finished reading the book, I felt like I knew and understood who this King really was a lot better. But the book too isn’t without faults. A huge chunk of the book is dedicated, obviously, to the politics of the time, from the Civil war to the Restoration, to all the problems and crisis Charles II had to face during his reign. While this is all very interesting and helps us understand both the times Charles II lived in and the effects all these events had on him, they are often related in a dry and, at times, boring way, that makes the book a bit hard to follow. 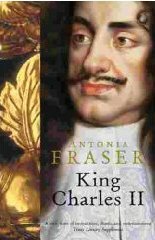 Overall, King Charles II by Antonia Fraser is one of the most (if not the most) throughout, detailed and well-written biography of this monarch. Fraser wonderfully portrays both Charles’ political and human sides, showing us who he really was. It is also full of details and information about this entire period of English history which allows the reader to better understand the King. But because these events are related in a dry way at times, they may bore some people.